Gridstatushots – adds functionality to hot tracking, including changing color of your own hots based on time left and tracks all hots on target. It provides support for using timers instead of boxes if desired. Gridsideindicators – adds icons to the top, bottom, left , and right on your frames. In addition to the corners. Gridindicatorsidetext– same as above but text on sides. There are 2 steps to showing countdowns instead of boxes. Use a status tracker such as gridstatushots (do not use default aura). Practical application: If i want to show renew, there are 2 ways to do it. The first is to use the generic way. You can add any aura/buff to the list and grid will show it in the place you specify. You can even tell it to only show yours. However, this will not support countdown text. It will say “RENEW” in the corner. It will be cluttered and yucky. Show “my renew” which is found under the the gridstatushots menu (it will only show you the options appropriate to the toon you are playing, so you cannot set up your priest renew settings while playing your shaman). Gridstatushots, and anything under that menu, will show you a countdown. Remember, to check the status box under the top left corner text menu and not the default generic “top left corner” menu. You want to leave the “top left corner” blank if you are using a text plugin in that spot. Otherwise you’ll get a box and text over the box in the same spot. Ick. Certain things are not supported by gridstatushots. For example: mending stack. So I downloaded a separate mod for that. Same with PW:S.
But I hate countdowns and I still want to know when something is about to drop off, you say. A lot of these special mods like gridstatushots allow you to have the color fade when the buff is about to drop off (you designate the threshold). You can use that instead of a countdown or in addition to a countdown. Whatever floats your boat. But remember, when you’re determining what status to show in “top right corner”, you check the “my renew” box, not the box for “renew” in general. I find it useful to show bad statuses, no matter what, even if I can’t cleanse them. At least I’ll know that someone needs extra healing. Which is why I downloaded “gridcornerplus“. There are now 4 possible boxes in each corner. I have one corner dedicated to all things bad (poison, disease, magic, curse). If I used every corner this way I might have a heart attack. Yeah, I know, it’s possible to have them all share a corner and use priorities. But I like to see everything I’m dealing with. Like in Yogg when you can have all 4 debuffs going at once. If you get no other grid plugin, get gridstatusraiddebuff. Reserve your center icon for it. This is stuff you will need to know – such as who has incinerate flesh on Lord J. Having this front and center will better enable you to react to stuff. I use gridstatusmts to put a little dot on the tanks. It will show up if a person is designated main tank by the raid leader in the default interface. 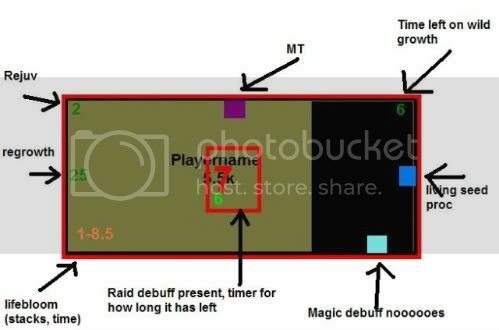 This is useful in all raids. Yes, in 25’s you can (and should) sort by 25+ tanks… but the little extra marker never hurts, especially if you’re doing PoH (you want to see who is in what group). I show total HoT’s on the target using gridstatushots. This lets me know if a tank is “hotted up” and whether I should panic or not. As a priest, I do show bubbles on the target, and any weakened soul. After all, it doesn’t matter who bubbled the target… he has a bubble, he can only have one at a time, so whether he is bubbled by anyone is important. 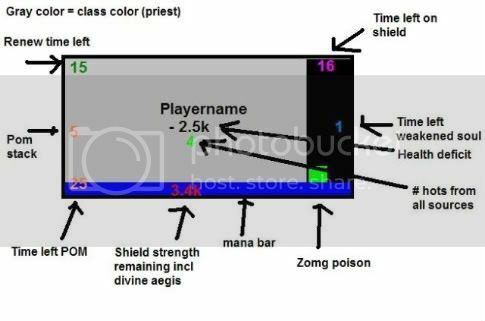 As a priest, I also show total shield left on the target using gridstatusshield (incorporates divine aegis and PW:S). Ok, it’s not great or exact, but it gives me a rough guesstimate of how much shield the mob has to eat through before I start to panic.